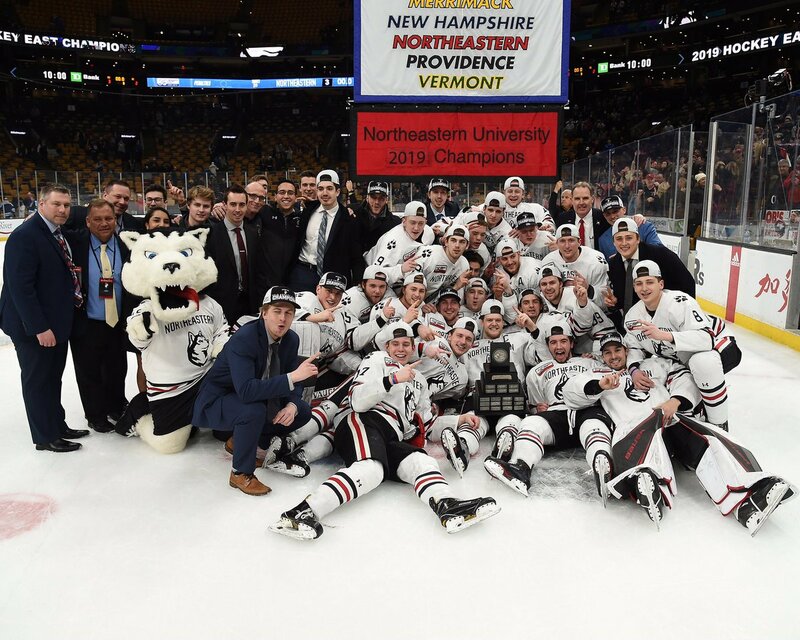 PROVIDENCE, RI – It was one of the roughest possible endings for an enchanted season for the Huskies. Northeastern surrendered five goals to the Big Red and will be watching the rest of the NCAA tournament from home. Cornell got off to a hot start with a goal just about four minutes into the game, and never seemed to take their foot off the gas. Despite the similar statistics in shots and faceoffs, the Big Red were able to play a smarter heavier game that forced sophomore goaltender Cayden Primeau to make mistakes and prevent the Northeastern offense from generating many grade A chances. Scoring opened up at 4:02 of the first period when senior forward Beau Starrett fired a wrist shot from the slot unimpeded on Primeau. The sophomore appeared to have made the initial save but was not able to clamp down quickly enough and let a dribbler get past him. The Huskies would go on the power play twice in the first period and generated very little from top to bottom. The size of Cornell seemed to be a difference maker as they could put their sticks in the lanes and prevent Northeastern from getting any sort of tic-tac-toe passing going. Less than a minute into the second period, senior forward Mitch Vanderlaan entered the zone and positioned himself well in the slot working past junior defenseman Ryan Shea. Vanderlaan roofed a wrister to beat Primeau and make it 2-0. Nine minutes later sophomore forward Morgan Barron finally capitalized on all of his offensive zone time with a beautiful wraparound goal to make it a three goal game. Cornell widened their margin of victory to four when freshman forward Michael Regush 12th goal of the year. The lone Northeastern goal came on the power play when senior forward Liam Pecararo hurled a wrist shot to the short side of sophomore goaltender Austin McGrath. The goal gave Pecararo 30 points on the season. Cornell would get the last laugh when sophomore forward Brendan Locke beat Primeau at the 4:34 mark of the third. The Huskies fell flat after that and skated the game out with little gusto. Northeastern hockey will be back in the fall. Until then, thanks for following along with WRBB all season long. 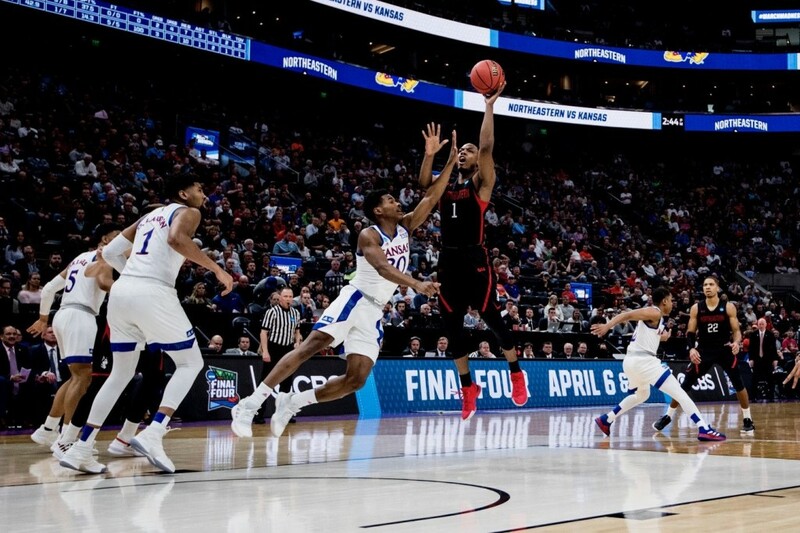 BOSTON — Curry Student Center erupted as Northeastern’s name flashed on the screen during CBS’ Selection Sunday broadcast. The Husky fans, coaches and players were excited just to get the chance to join the field of 68 teams in the NCAA Tournament. But the news delivered at Sunday’s watch party — the Huskies earned a 13 seed, and will take on 4-seed Kansas in a Thursday matchup in Salt Lake City in the Midwest Region — only heightened the excitement. “Just to see your name pop up, it’s a dream come true for all our players and staff,” said Northeastern coach Bill Coen. 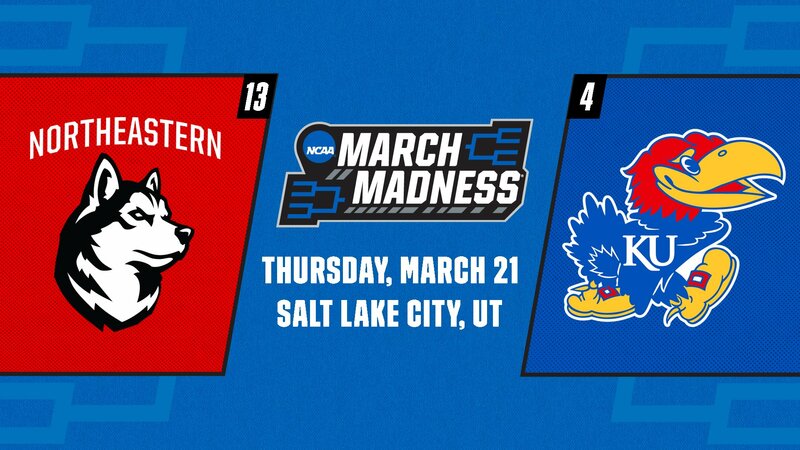 The game will tip off at 4 p.m. on Thursday. The Huskies (23-10) earned the Colonial Athletic Association’s automatic bid to the Big Dance after a 82-74 victory over Hofstra in the CAA Championship in Charleston. Northeastern is led by two-time All-CAA First-Team point guard Vasa Pusica (17.8 ppg, 4.2 apg, 3.9 rpg), and All-CAA Third-Team shooting guard Jordan Roland (14.7 ppg, 40.8% 3PT FG). Pusica is a redshirt senior transfer from University of San Diego, while the redshirt junior Roland transferred in from George Washington. 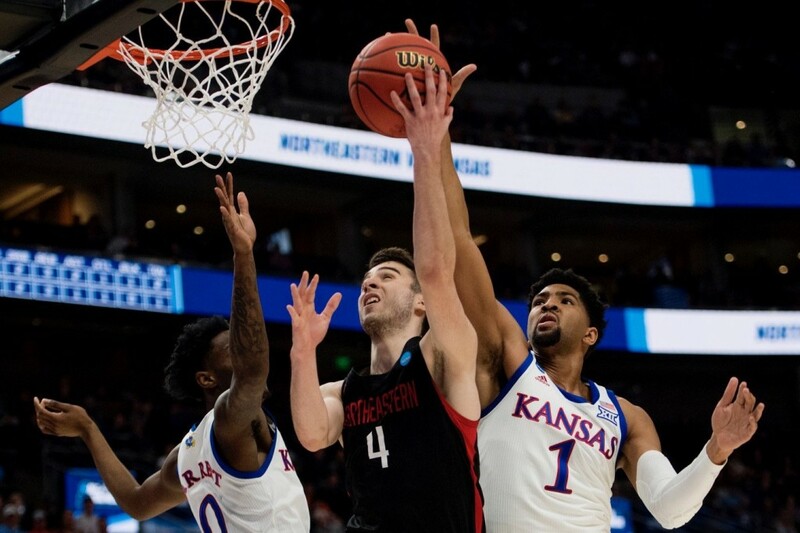 Northeastern’s formula relies on three-point shooting, defense and depth. The Huskies are the 16th best three-point shooting team in the country at 38.8%. Players like junior guards Shawn Occeus (10.1 ppg), Bo Brace (10 ppg) and Donnell Gresham (9.8 ppg) are huge pieces in a stingy defense that ranked at the top of the CAA. Seven different players average 8+ points per game. Coen, in his 13th season at Northeastern, led the Huskies to the tournament in 2015, when NU fell in a close game to Notre Dame. Kansas (25-9) finished 3rd in the Big 12, failing to win the conference’s regular season title for the first time in 14 years. The Jayhawks lost in the Big 12 championship game to Iowa State, 78-66. “I wanted to play someone big like [Kansas] and I couldn’t be more excited,” Pusica said. They’re led by redshirt junior forward Dedric Lawson, a 6-foot-9 presence that averages 19.1 points and 10.3 rebounds. Lawson, a transfer from Memphis, shoots 48% from the floor and 37% from three. He could be a matchup problem for Northeastern. The Jayhawks started four freshman in the loss to Iowa State. The lead man among those rookies is point guard Devon Dotson (12.1 ppg, 3.6 apg, 2.6 rpg). Kansas head coach Bill Self, in his 16th season, has dealt without some of his key players down the stretch. Senior guard Lagerald Vick (14.1 ppg, 4.1 rpg, 45% 3PT FG) took a leave of absence from the team in February for personal matters, and will not return for the tournament. Seven-foot junior center Udoka Azubuike (13.4 ppg, 6.8 rpg, 71% FG) is out for the season with a hand injury. The three ball is going to be key in this matchup, as it has been all year for the Huskies. Kansas holds opponents to 33.6% from three. When Kansas holds opponents under that average, they are 15-1. In other games, Kansas is 10-8. Essentially, Northeastern needs to hit their threes to stay in the game. Fortunately for the Huskies, they shot nearly 39% from three over the course of the season. Since LaGerald Vick (46% 3PT) went out for the season, the Jayhawks have shot just 33.2% from beyond the arc. The Huskies turn the ball over on 16.7% of possessions. When they turn the ball over less than their average, they are 14-2. In all other games, they are 9-8. Kansas’ opponents turn the ball over on 18.5% of possessions. The Jayhawks have won three national titles, with the most recent coming in 2008. The school has made 15 Final Four appearances, with Self leading Kansas to Final Four appearances in 2008, 2012 and 2018. Kansas fell to Villanova in last year’s semi-final. “It would just make the win mean more, if we are lucky enough to win the game,” Roland said. BOSTON, MA – They held on by the skin of their teeth, but the Northeastern men’s hockey team narrowly defeated the Maine Black Bears 2-1 on Saturday night. A full team effort was required to punch their ticket to TD Garden, but key contributors like sophomore goaltender Cayden Primeau and junior defenseman Jeremy Davies helped secure a spot in the Hockey East semifinals. Scoring opened up with just under two minutes left in the first period when senior forward Pat Schule went to work behind the Maine net and found junior forward Biagio Lerario open in space in front of the net. Lerario took the pass from Schule and launched a backhand shot to the top corner of the goal. The puck went through a hole in the net and the officials waved off the goal initially before reviewing the play. As it turned out, the puck did indeed cross the goal line and Lerario was rewarded with the first goal of the game. Senior forward Brandon Hawkins extended the Husky lead to two when he scored a 5-on-3 power play goal with a howitzer from the blue one. Hawkins was positioned at the left side of the point and perfectly timed a one-timer from Davies. It was Hawkin’s 10th goal of the year and Davies’ 26th assist. Senior forward Liam Pecararo also earned an assist on the goal. Maine brought the game within one on their own 5-on-3 power play. Senior defenseman Sam Becker was quarterbacking the powerplay at the top of the slot then quickly sauced a pass to freshman forward Jacob Schmidt-Svejstrup who rifled a shot past Primeau for his 6th of the year. The third period was one of the tensest in Historic Matthews Arena recent history. Primeau made a total of 12 saves and the Husky skaters recorded 13 blocks, tallying 26 total on the evening. Freshman defenseman Jordan Harris lead the team with 6, and senior defenseman Eric Williams had 3 in the third period alone. Schule committing a nearly fatal tripping penalty with just under five minutes left in regulation, but the dogs were able to bear down and fight off the Black Bear onslaught. Northeastern’s opponent in the semifinals is yet to be determined, but they will play again Friday night at TD Garden. BOSTON, MA – It was a dramatic conclusion to one of the best season’s in program history. Cornell freshman forward Gillis Frechette scored an overtime breakaway goal to end Northeastern’s bid for an NCAA title. In the Husky’s first ever home NCAA tournament game, the Cornell Big Red came down from Ithaca with heavy skating and stalwart defensive play. Neither team eclipsed 30 shots on goal, and both defenses registered double digit blocks. Scoring would open up at 13:28 into the first when junior froward Amy Curlew got the beat on sophomore goaltender Aerin Frankel from right in front of the crease. The Big Red had been buzzing all period and ended up leading the shot on goal advantage 11 to 5 when the period ended. Before the Huskies were free for the intermission, sophomore defender Skylar Fontaine committed a late body-checking penalty which put Cornell on the power play. Excellent puck movement and a perfectly placed tip from junior forward Grace Graham sent the Huskies to the break with a 2-0 deficit. Sophomore defender Devon Facchinato fired a wrist shot from the blue line, and Graham – who was all alone in front of Frankel – earned her 11th goal of the season. The second period would come and go without a goal, but the Huskies did fight back a bit and win the shot battle 9-5. Northeastern went on the power play twice, registering seven shots between the two advantages. The Huskies would finally break through in the third. Junior forward Andrea Renner and sophomore forward Veronika Pettey broke into the zone in an odd-skater rush, and Renner ripped a shot high glove side that rolled off of senior goaltender Marlene Boissonnault’s shoulder. Pettey showed no quit on the play and went diving after the loose change to deposit it in the back of the net for Northeastern’s first goal at 9:32 of the period. With just about 5 minutes left in the game, Fontaine was able to skate unimpeded into the Big Red zone. From high in the slot she ripped a wrist shot that cleanly beat Boissonnault, and the score evened at 2. Just over five minutes into the extra frame, Frechette took a pass from senior forward Diana Buckley to the house and gave Cornell their fourth ever win in the NCAA opening round. The Big Red will play the winner of the Minnesota Princeton game. BOSTON, MA – In true Northeastern fashion, it would take about five minutes of extra hockey for the Huskies to defeat the Black Bears when sophomore forward Austin Goldstein scored his first of the season to end things with a 2-1 victory. Sophomore goaltender Cayden Primeau made 36 saves, including 16 in the second period alone. The pendulum of momentum swung back and forth vigorously all game as the Huskies tried to use their speed to match the Black Bears size. Sophomore forward Eduards Tralmaks nearly started scoring in the second period as the Black Bears almost netted a short handed goal. Tralmaks and sophomore forward Emil Westerlund entered the zone on the right side of the ice. Westerlund burned past the Northeastern defense, skated to the goal line then put the puck into the crease. Primeau was unable to get a hold of it before Tralmaks knocked it in off his skate. The officials reviewed the goal and determined there was a distinct kicking motion. Scoring opened up at 8:29 in the first when senior forward Lincoln Griffin forced a turnover and found freshman forward Tyler Madden streaking into the slot. Griffin put a pass perfectly on Madden’s stick who ripped a wrist shot past sophomore goaltender Jeremy Swayman to light the lamp. Senior defenseman Eric Williams whiffed on a shot from inside the Black Bear blue line; sophomore defenseman Brady Keeper would end up skating into the offensive zone unimpeded. He was able to beat Primeau cleanly high on the blocker side. Neither time could light the lamp in the third period. Primeau made 11 saves while Swayman made 13, and the pipes had their fair share of work to do as both teams rung iron in the final frame. In today’s edition of unlikely heroes, sophomore forward Austin Goldstein scored his first goal of the season on a breakaway to send the fans home and put the shirts back on the kids in the DogHouse. Northeastern will look to close the series out tomorrow night when they drop the puck with Maine for Game 2 of the Hockey East Quarterfinals at 7pm tomorrow. 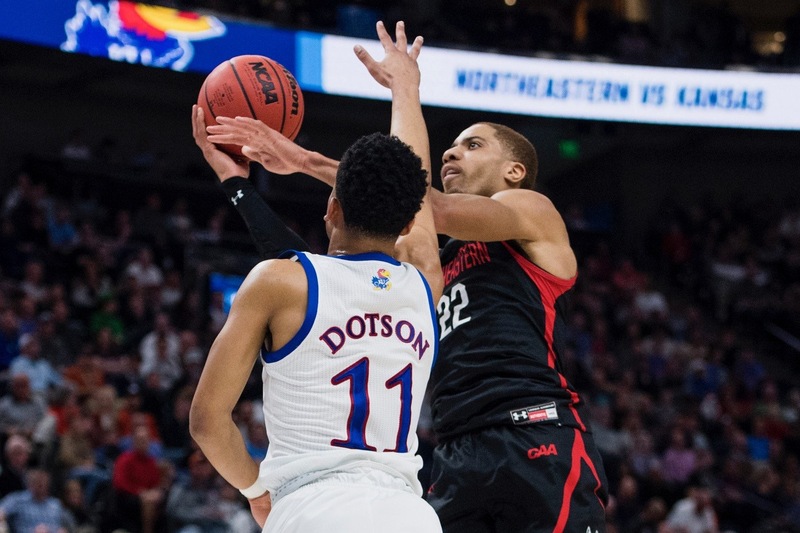 NORTH CHARLESTON, S.C. — All season long, the Northeastern men’s basketball team relied on three-point proficiency, a deep roster and a veteran point guard that made it all go. All three of those keys were on display Tuesday night in the North Charleston Coliseum, as the Huskies (23-10) knocked off Hofstra, 82-74, in the championship game of the Colonial Athletic Association to earn the conference’s automatic bid to the NCAA Tournament. Redshirt senior point guard Vasa Pusica scored 15 of his team-high 21 points in the second half to earn the tournament’s Most Outstanding Player award. “This means the world to everybody,” said junior guard Shawn Occeus. Seven Huskies tallied nine points or more, including junior forward Bolden Brace (10 pts, 10 rebs, 9 assts), who narrowly missed a triple-double. The two-seeded Huskies shot 50% from the floor and 45%(14-31) from three, while holding top-seeded Hofstra to 39% from the field and 30% (6-20) beyond the arc. The Huskies will find out their seed, foe and tournament site for the NCAA Tournament on Selection Sunday, March 17. “My sense of pride for this group of young men, all they’ve been through and all they’ve accomplished, [is huge],” said Northeastern head coach Bill Coen. Hofstra senior guard Justin Wright-Foreman — the CAA’s two-time reigning Player of the Year — led the Pride (27-7) with 29 points. Only junior guard Eli Pemberton (15 pts, 7 rebs) joined Wright-Foreman in double figures for Hofstra. The Huskies led, 15-8, when Pusica fouled Hofstra senior guard Desure Buie (8 pts) on a made three-point attempt to pick up his second foul with 10:15 to go in the first half. The point guard had six of the Huskies 15 points, but was sent to the bench, and Buie’s four-point pay closed the gap to 15-12. NU’s other players picked up the slack, finishing the half on a 27-14 run without Pusica on the floor. Redshirt junior guard Jordan Roland (11 points) hit three triples during the stretch, and Brace, Occeus (11 points), and senior center Anthony Green (9 points, 7 rebs) each contributed 4+ points in the stretch. The Huskies led, 42-26, at halftime. Hofstra scored the first eight points of the second half to bring the deficit to eight, on a run capped by a triple from junior forward Tareq Coburn (9 points, 4 rebs). The Pride made a second run midway through the second half, erasing a 54-44 deficit with a 10-run from the 12:29 mark to the 9:13 mark of the second half. With the score knotted a 54-54, Pusica stepped up. The senior buried a triple to end the Hofstra run and regain the lead, and then buried a dagger three with 3:58 remaining to cap a 17-6 run that put the Huskies up, 71-60. “I knew that I hadn’t played a good game to that point, so I just wanted to pick it up,” Pusica said.